Late night craving are a funny thing. One night I’m wanting hot buttery popcorn (thanks Netflix! ), the next I feel like sour Skittles. There are multiple reasons why I don’t keep junk food in the house. For the most part it’s to keep things healthy but if cravings hit hard, it forces me to be more creative. One night I just wanted something sour. I did the usual fridge sweep and turned up some less than perfect red plums. After stewing them in a bit of sugar, I poured the warm concoction on a bowl of vanilla ice cream (hey, we can’t all be angels!). The result: instant bliss and some left over stewed plums for later. Cravings satisfied, I began to wonder what I should do with the extra stewed red plums. That night while I was feeding my sourdough starter, Stan, I realized that I have yet to bake something other than sourdough loaves. 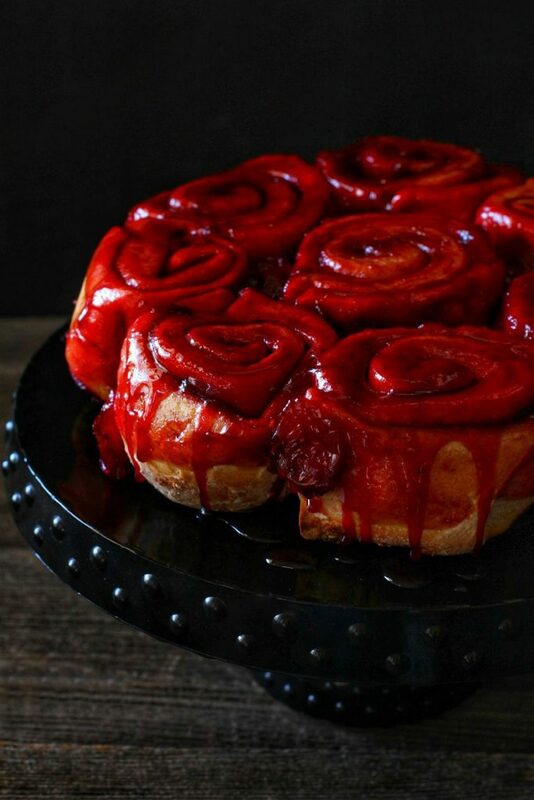 Then I started craving cinnamon rolls. The natural thought progression eventually led to me using the cast off starter to begin a new dough. 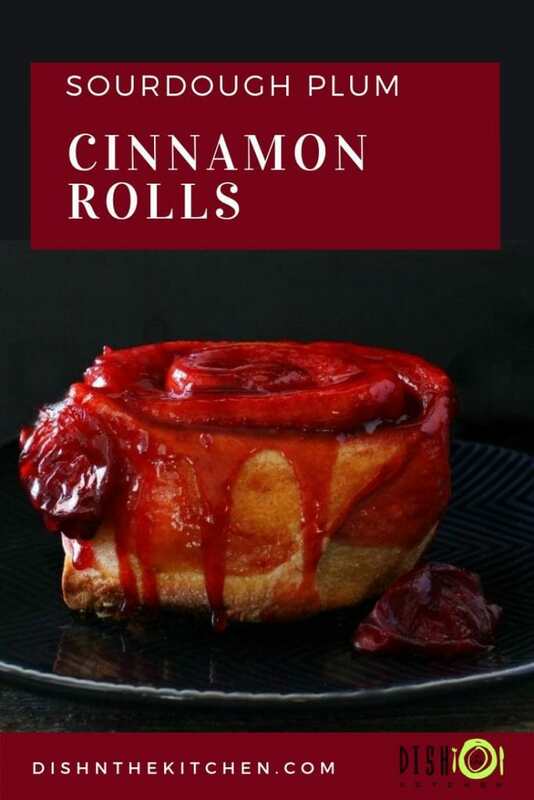 This new dough was to be made into cinnamon rolls the next morning and what better way to use up the stewed red plums? 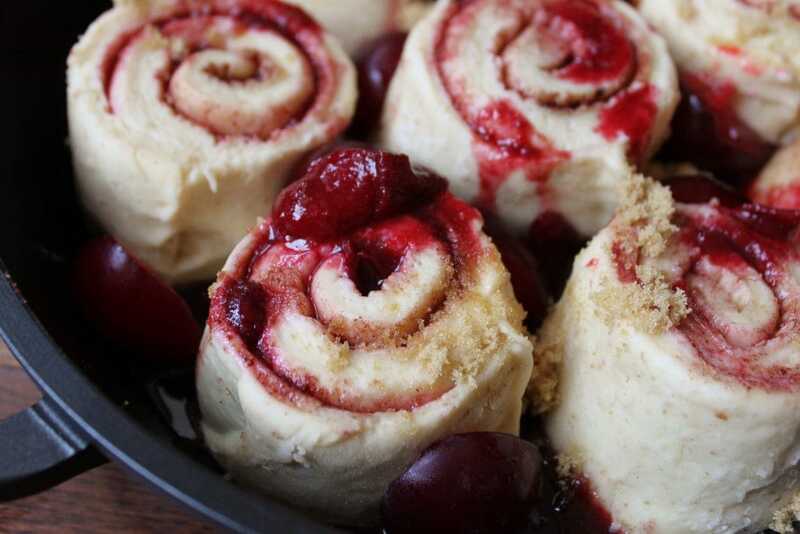 Sourdough Plum Cinnamon Rolls! Once the dough was mixed, I found it quite stiff. With sourdough, you really have to trust the process. By this I mean, let the starter do the work and you will be greatly rewarded! The next morning I uncovered the dough bowl to find that the sourdough process hadn’t let me down. I carefully let the dough out of the bowl onto an oiled and slightly floured counter. Using my hands, I gently spread out the dough into a small rectangle until I felt a slight resistance. Leaving the dough at this point allows it to relax enough to roll out. After waiting 15 minutes, gently roll the dough out using a rolling pin, again until you feel resistance. You may have to repeat this process several times. Once everything was rolled out, it was time to spread the filling. I did the usual butter, cinnamon, and brown sugar but also dropped the stewed plums at regular intervals. I cannot emphasize enough how important it is to leave the top inch of the dough completely free of filling. You need it clean so that your dough seals after it’s all rolled together. Once you have rolled and sealed the dough, grab a length of dental floss and cut the rolls in equal portions. I don’t even remember where I was given this kitchen hack but I have used it for years. Dental floss does not flatten the dough in any way like a knife would. Let’s hear it for kitchen hacks! Arrange those beauties in a round or square 9 x 9 pan, scatter more sugar and top with even more freshly pitted and cut red plums. 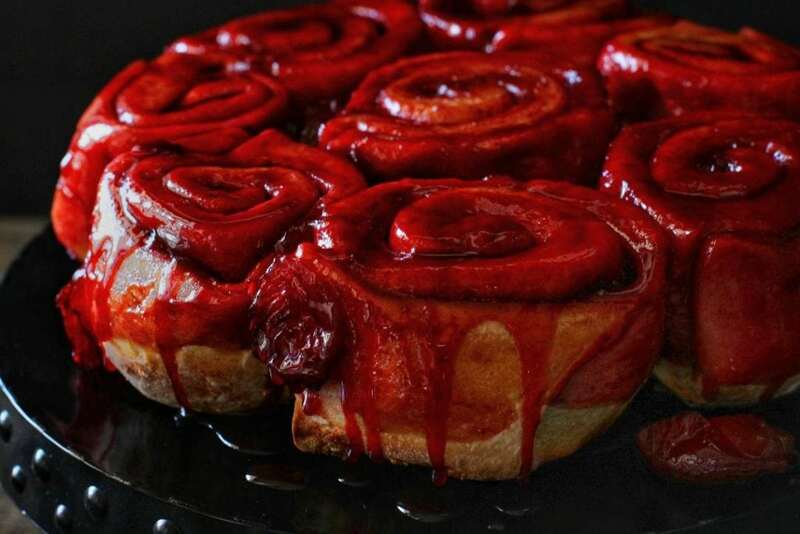 During baking, they’ll combine with the sugar to make a very delicious and striking sauce for your buns. These Sourdough Plum Cinnamon Rolls began as a cool little sourdough experiment to use up leftover stewed plums and starter discard. I hadn’t planned on posting them as a recipe but when I flipped them out onto the plate, I just had to whip out the camera. I spent the next two hours drooling and attempting to photograph them in a (new to me) dark style. Then, I grabbed a plate and gobbled two of them at once! 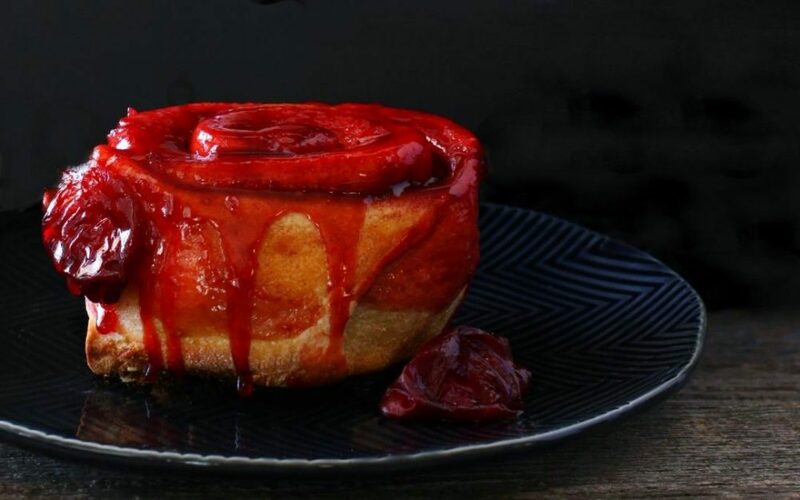 These Plum Sourdough Cinnamon Rolls are made with fresh red plums, giving them a stunning red colour and slight sweet and sour sauce. The dough requires an overnight rise. Add egg and sugar to a stand mixer bowl. Combine them briefly with a paddle mixer. Add in sourdough starter. Gently add dairy to the bowl of the mixer while running on the lowest setting until just combined. Add in flour, 1/2 cup at a time until dough is fairly stiff. Add salt after the first addition of flour. (you may not use the entire 2 1/2 cups flour). Cover and let dough rest for 30 minutes. Give the dough four quick folds, each grabbing the outer edge and bringing it towards the centre of the dough and rotating the bowl a quarter turn. Coat a medium bowl with a light layer of butter and place the dough inside. Lightly spray your work surface with oil or use a liquid oil and rub it on. Scatter flour over all to prevent sticking. Carefully remove the dough from the bowl onto the prepared surface and gently pull it into a small rectangular shape (about 8 x 6 inches). Let rest for 15 minutes. Lightly dust your rolling pin in flour and begin to gently roll the dough out until it becomes 12 x 16 inches (with the longest side being horizontal). You may have to do this gradually as the dough might offer some resistance. It's best then just to let it relax again rather than force it outward. Spread the softened butter over the 12 x 16 rectangle, leaving a dry inch or so on the top edge. Scatter the brown sugar then sprinkle the cinnamon over all. Spoon the stewed plums equally over the dough. 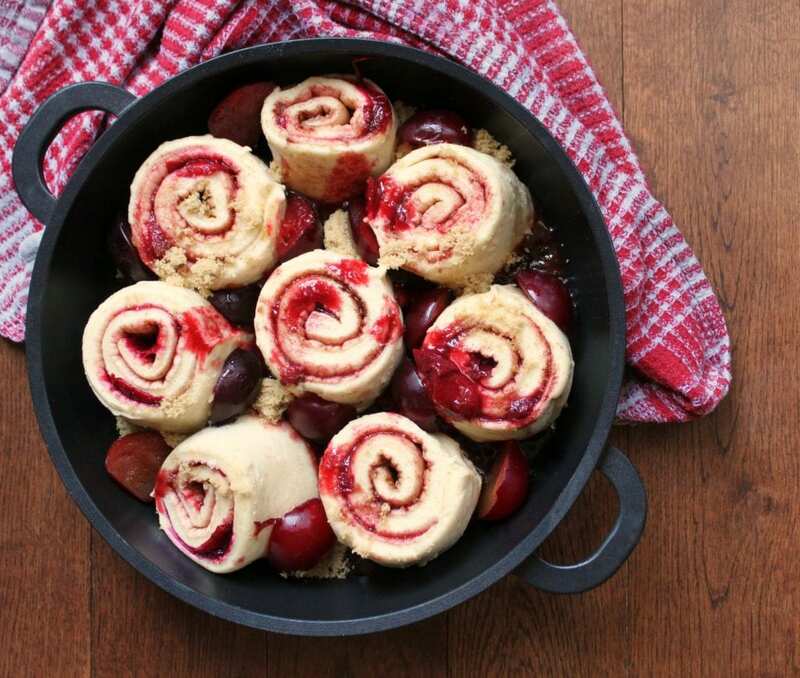 Begin to roll the dough upward, taking care to include the stewed plums into the roll. When you've rolled the dough all up, pinch the edges together to seal. Slide a length of dental floss underneath the dough log until you reach the centre. Bring the ends of the floss upwards and criss-cross them so that they cut through the dough. Cut each side again, then cut those pieces again until you have 8 dough rolls. Arrange the dough rolls in a 9 inch round or square non stick cake pan. Cover and let sit until puffy (1-2 hours depending on your kitchen temperature). Pre-heat oven to 350 F and remove cover from rolls. Scatter the remaining portion of brown sugar in between and over the buns. Place fresh plum halves intermittently between the rolls. Bake for 40-45 minutes in the centre of your oven. Set timer for 40 minutes and check for golden brown tops when the timer rings. If they aren't browning...bake for another 5 minutes. Let cool for 8 minutes and cover with desired serving plate. Flip over in one swift motion and allow the rolls to migrate onto the plate. Thank you so much Denise!! 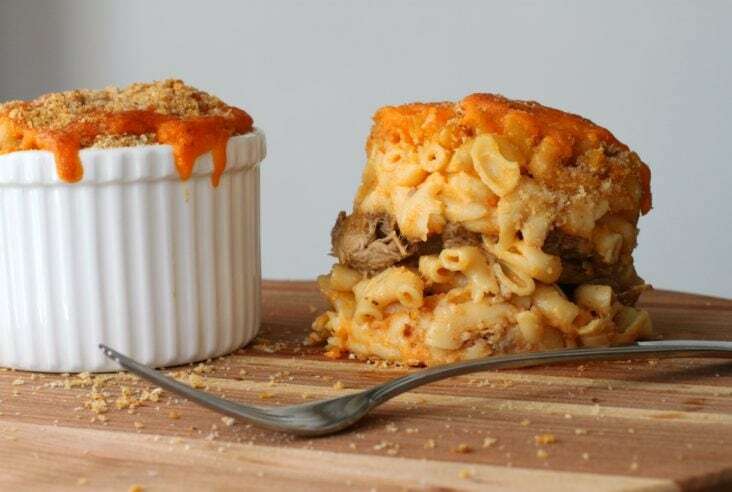 It was a pleasantly surprising little experiment, both the recipe and photography. I’ve never tried a dark style before and it was kind of fun. Still so much to learn!